"But if you truly believe you've found your purpose in life, as a storyteller, then you must also believe that no matter what hurdles you encounter, you will prevail." 1. Complete one chapter of my novel each week. And that's all. It definitely seems doable and I'm pretty sure it will morph into more. What are your goals for March? It’s the Depression, but Red’s family is managing better than most on their Prince Edward Island farm. Hard working and resourceful, they have enough to eat and to help others, even if at times they are mocked by their neighbours for putting education ahead of farm work. Eleven-year-old Red has plenty of chores around the farm, and the days can be long, but he still gets the odd break to go swimming or fishing, provided his homework is done. Red’s older sister, Ellen, teaches at the local school, and if Red doesn’t shine, she will not only punish him, but also make sure their parents hear about it. But then Red’s father’s hand is seriously injured and the family’s situation looks dire. Red steps up to the challenge, finishing the tobacco boxes that his father makes and helping shovel out a train stuck in the snow. Stubborn and even pigheaded, Red does make mistakes along the way (such as pretending to be dead so that his younger sister will stop following him), but his heart is always in the right place. This book is a series of six related stories about events in 11-year-old Red’s life during the time of the depression. It was an easy and fun read, with lots of little details about life during that time period – it reminded me of the stories my Dad used to tell about the pranks and fun he had as a kid. I loved the author’s writing style. There was a good balance between action, description and dialogue that kept the story interesting. This book is nominated for the Ontario Library Association’s Forest of Reading in the Silver Birch (Fiction) category for 2012. I’ve profiled a few of the other nominated books: The Glory Wind, Ghost Messages, and Undergrounders. 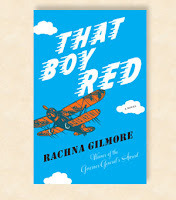 Rachna Gilmore got the idea for this novel from listening to family stories, but she was careful to make sure this was a work of fiction. You can read more about this in her blog post, There’s Gold in Them Thar Tales: Spinning Family Stories Into Fiction. Rachna Gilmore has also written many picture books, including A Screaming Kind of Day, The Flute, Catching Time, Wild Rilla, Lights for Gita, Roses for Gita, and A Gift for Gita, among others. For more, go to Rachna Gilmore’s website. Do you ever look back at your old writing and see common threads or themes that you can’t seem to escape? I don’t really even have any baking or cake-making expertise, except for around the house kind of fooling around. And an obsession with visiting cupcake shops when we're on vacation. Maybe all this is telling me something—I should be taking cake baking classes instead of writing? Hmm. At least I'd get to eat all the practice versions instead of sticking them away in drawers. What keeps cropping up in your writing? Do you work to avoid it or try to expand on it? Gracie is unlike anyone Luke has ever met—fun, charming, imaginative and full of life. But when the truth about her mother’s past challenges local small-town values, Luke finds himself caught up in a whirlwind of confusion and controversy. 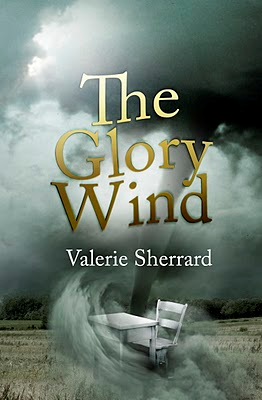 A striking novel of loyalty, loss, and redemption by celebrated author, Valerie Sherrard. When Luke makes friends with Gracie, the daughter of a young widow who has moved in next door, he finds it confusing that the townspeople begin gossiping and even shunning Gracie’s mother. Because it’s 1946, much of what is going on is not appropriate for his ears, so he has to try to figure it out from the bits of information and gossip that he overhears. This story was not what I expected from the tornado scene on the cover. This serious story moves at a fairly slow pace that allows the reader to think and absorb the confusion Luke is feeling. Although a tornado does figure in the story, the main storyline is more about bullying, prejudice, and making judgments about others. It raised many questions in my mind as I was reading and really made me think about what it might be like to live in that time period—and how, unfortunately, some of the things we experience in our society today are not as different from then as we might hope. From a writing perspective, I enjoyed the way the author managed to recreate the time period through the character’s language and the story descriptions. Even though the main character was 11 at the start of the story and the writing is appropriate for the middle grade level, the deeper issues and complexity of this story made me feel it was almost more of a YA novel. On her blog, Valerie Sherrard talks about how the idea for this story grew from a tiny snippet of something she heard on the news. This book has won the 2011 Geoffrey Bilson Historical Fiction for Young People Award, the 2011 Ann Connor Brimer Award, and received a bronze medal in the 2011 Independent Publisher Book Awards, Canadian Regional. This book is nominated for the Ontario Library Association’s Forest of Reading in the Silver Birch (Fiction) category for 2012. 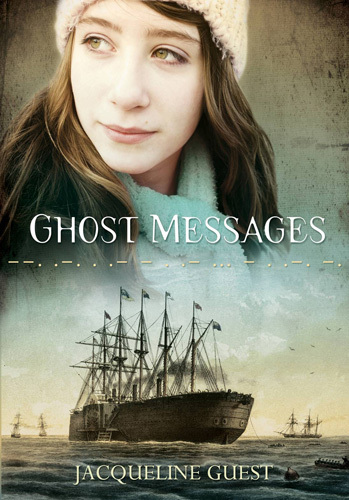 In case you didn’t catch it, last week I profiled Ghost Messages by Jacqueline Guest, another one of the nominated books. For more, go to Valerie Sherrard’s website. Pacing, the momentum that pulls us through the story, can be hard to get right. Too slow and the reader loses interest. Too fast and the story can get confusing. Cut down on transitional scenes. Does your novel have scenes or sentences where all you're doing is moving the character from one place to another? Consider cutting or reducing them. Transitions are boring and don’t need much detail. Start the story later. After the hook brings us into the story, we still need something to keep us reading. Starting part way into the story, or at the place where we meet the story problem can give the beginning of the story some momentum. Pare down backstory. Backstory can make the story drag. It may be interesting to you, but not your reader. Take agent Kristin’s advice (and the advice of practically every other agent and editor) and use only little bits. Summarize. We always hear about the dangers of “telling” instead of “showing”, but a little bit of telling can be effective too. I sometimes use it to give a reader a piece of information that may help with flow of the story, without taking up the space of an entire scene. Just make sure it’s not something crucial to the plot. Intensify beginnings and endings. Scene or chapter beginnings and endings should be compelling. Sometimes, we worry about this early in the novel and forget in the middle section. For kid readers, any hint that it might be boring can mean they don’t finish the book. Why risk losing their attention? Shorten chapter length. Short, snappy chapters can keep the story flowing, especially in children’s books. Kids also get tricked into thinking there isn’t so much to read, if there are short chapters and lots of white space. Cut unnecessary explanatory phrases. Check out agent Mary Kole’s post on eliminating the frame. You might not even realize you're doing this. Use shorter words. If I need a dictionary every paragraph or two, there are probably too many interesting words. Do you have any tricks for speeding up the story pacing? *As usual, if you come across any useful resources on this topic, let me know and I’ll add them to this resource. April Henry points out two ways to improve pacing. Lisa Gail Green talks about pacing for pantsers. Be sure to read the comments on this one, because they are full of great insights. Agent Kristin Nelson talks about pacing in her vlog: Why Page Length for YA or MG Novel Is The Wrong Question. Consider these techniques to establish pacing, from the Writer’s Store. Over at Dark Angel’s Fiction Writing Tools, romance author Roz Denny Fox writes about pacing your novel. At Janice Hardy’s blog, guest author Jana DeLeon shares some thoughts on slow pacing at the beginning of a novel. Jess at Falling Leaflets suggests you consider timing and transitions in pacing your novel. Thirteen year-old Ailish, a feisty Irish fortune-teller, is about to become part of history. She becomes trapped on the mighty Great Eastern just as the ship sets off on its voyage to lay the very first trans-Atlantic telegraph cable. Escape is impossible! Ailish must pretend to be a boy to keep from being pitched into the ocean by the superstitious sailors, while dodging a dangerous ruffian who has stolen her golden treasure. She frequently gets help from a pale young boy named Davy, who seems to know everything about the Great Eastern, but won't ever come up on deck. Will Ailish's wits, her determination, and her friendships help her to survive the trip, find her treasure and solve the mystery of her young companion? I love all the action in this story, as Ailish tries to keep her identity hidden on the ship while looking for her Dad’s treasure. Even though there is a picture of a girl prominently on the cover, I think both boys and girls would enjoy this story with all its details about life on the ship and possible sabotage of the cable. This novel opened my eyes to a piece of history I’d never given much thought to before – how cable was laid under the ocean to make it possible for people to quickly communicate between North America and Europe, without having to wait weeks for messages by boat. I appreciated the author’s notes about how she became interested in this part of our past and how she used historical facts in writing this story. As a writer, it’s interesting to see how the author uses words and expressions to convey the time period without making the story too stiff and distant to connect with contemporary readers. This book is nominated for the Ontario Library Association’s Forest of Reading in the Silver Birch (Fiction) category for 2012. If you aren’t familiar with the Forest of Reading program, here’s how it works: Professionals from schools and public libraries nominate a selection of books in a specific category, students from all over the province read them all and then in April they vote for their favourite. Here’s my writing buddy Debbie Ridpath Ohi’s take on last year’s celebration. 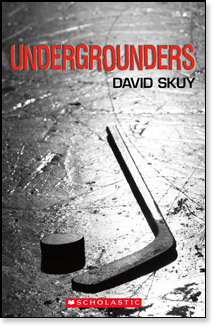 In case you didn’t catch it, last week I profiled Undergrounders by David Skuy, another one of the nominated books. For more, go to Jacqueline Guest’s website. "...I came to an understanding of what I think write what you know means. To me, it means taking the emotions you’ve felt through your real life experiences and transposing those onto your fictional characters." I just got to the last page of another one of my writing notebooks - that makes 22 of them now. I've been writing ideas, collecting bits of advice and inspiration, and working out story events and happenings for many years - some years only have 1 or part of a notebook/journal, others have more than one. Sometimes when I read some great writing tips or a new perspective on a writing-related topic, I copy it and paste it in my notebook (with source info). In the past year, I've gone through probably 3 notebooks. I do read over some parts of them, while they are still current, but once they are full and up on my shelf, I don't go back to them very often. But I do think it's useful to look at them sometimes. 1) Some story ideas seem to resurface again and again, in slightly different ways. Usually when that happens, I know I need to write that story. 2) I like to see how far I've come and how my skill has developed. 3) All the tips and advice that I've collected are like a "mini" writing course. 4) Re-reading the inspirational bits and pieces is a great boost since they seem fresh and interesting again. 5) When I'm stuck or not sure about what direction to take in my writing, looking through my old notebooks reminds me of all the great ideas I had, and often gets me thinking of more. Do you ever revisit your old notebooks or journals? What I need to do is just start writing. My best strategy is to start with one tiny bit. A paragraph. A sentence. (Yes, I've had days where all I've written is a sentence. It was a darn good sentence, too). It's the same way I tackled my revisions. Even though it seems like a snail-like process, writing a small amount every day eventually amounts to something. I'm hoping it will start a snowball effect where I just can't not write. Do you have any good tips for getting back into the writing flow? Ever since his mom died, Jonathon has been on his own, living on the streets. The Underground gives him a place to sleep, but it’s not like having a real home or being a regular kid. That seems like an impossible dream . . .
Jonathon has been living on the streets ever since his Mom died. He survives by earning a little money panhandling and running errands for tough guy Lewis. He shelters from the cold in an abandoned shopping mall, hanging out with a group of street kids called the “Undergrounders”. Then, while playing hockey with some stolen gear, Jonathon makes friends with some regular kids. It seems like a dream come true when they invite him to join their team. But now Jonathon has to find a way to keep his homelessness a secret so he can keep his place on the team. This is a fast-paced story with lots of authentic hockey action. I’m not even a big hockey fan, but I got totally hooked by the strong voice and the details about Jonathon’s life as a street kid. I think boys will especially enjoy this book. Although I found the story a little predictable, I liked the way it made me think about a different way of life. From a writing perspective, I’d look more closely at this one to study how to create a believable first person voice. The way the author wove in Jonathon’s thoughts and emotions helped me lose myself in his story. For more, go to David Skuy’s website. Since my latest character has a finely-tuned sense of smell, I’ve been using a lot of smell-related words and descriptions in my writing. As I wracked my brain, thinking of unique ways to sprinkle descriptors into my writing, I compiled this list of smell related words – I’m sharing in case it helps someone else out.